All through the motor industry now there is an expectation that diesel is going to get a wallop in the Budget. A price increase at the pumps will shift perception of diesel cars a little more. But so many people need and use them that they will continue to buy in significant numbers – unless the Government does something outrageous at short notice. A previous government did (when our car taxation basis shifted to emissions from engine size in 2008). Here’s hoping for common sense. In the longer term, there are all sorts of doomsday forecasts on diesel, with some countries undertaking to ban the fuel altogether within a decade or so because of perceived and proclaimed health risks in urban areas especially. I think there is a shift, but I don’t think diesel’s days are as acutely numbered as some would have you believe. Of course manufacturers have sniffed the shift for some time so now we are increasingly seeing the fruits of technological developments which more equally pit petrol engines against diesel. As it happens I drove two of the new breed of petrol this week: a 1-litre in the Honda Civic and a 1-litre in the Audi Q2. This was my first taste of the Civic in Ireland – I drove it extensively abroad. I’m glad to report my initial judgment hasn’t changed much. It’s even better looking from behind than I thought, although I’ve heard criticism of the design being too fussy. I think it looks the part. I’m not going to go back over old ground with you on a test-drive report that more or less confirmed what I found previously to be the case. * The 5dr hatch costs from €23,750 ex-works (I’ll come back to that). * It is much bigger inside. * The 127bhp 1-litre i-VTEC turbo will be joined by a 180bhp 1.5 i-VTEC turbo next month and a 1.6-diesel, currently being upgraded, later this year. * There will be a TYPE R early next year – it looks wonderful. * There is a 6spd manual gearbox and an ‘automatic’ CVT (Continuously Variable Transmission – €1,600 more than manual). The really important bit, for me, is that they have a standard package of safety systems called ‘Sensing’. I find it impressive. It includes intelligent adaptive cruise control, forward collision warning, Collision Mitigation Braking (stops the car if it senses a front-end crash is unavoidable), lane departure warning, lane keeping assist system, road departure mitigation, Intelligent Speed Assistance (adjusts speed to that indicated by the last road sign), low speed following – keeps distance at low speeds and traffic sign recognition. That list partly explains why the car’s price starts at €23,750. And I’m all for that: give people a good spread of safety and comfort and charge a reasonable price. I’m sure if they tried they could have had an entry-level version for a few grand lower, but what would that acheive? Few people buy basic any more. The cabin is smart, comfortable and a nice height. We took off for Wexford on a bright, spring day. 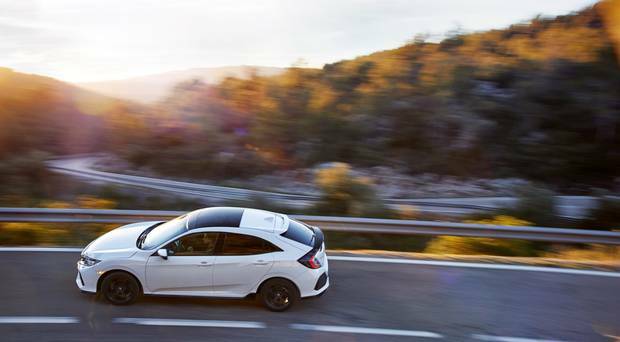 The new multi-link rear axle gave the Civic a bit more handling zest, but the engine took the honours. This is a big car now, but the 1-litre showed no shortcomings on torque or power. They claim consumption of 4.8l/100km (110g/km, €190 road tax). The figures for the CVT are: 106g/km (still €190) and 4.7l/100km – it is not nearly as nice a drive. The 1.5 litre 4cyl (133g/km, €280) has a claimed 5.8l/100km with its impressive CVT at 139g, €280 tax, 6.1l/100km. They say the 1.5-litre will be in demand for sportier drivers and orders are reflecting such interest. But for most of us the 1-litre is going to make sense. I’d stick with it. Given how things are going, it is another significant marker for our use of petrol in the years ahead.